IT is not so long ago that the thought of African “Chitenge” clothing as funkyand contemporary would have not only been laughable but very quickly dismissed as belonging to market stalls in townships. But one Towani Clarke has revolutionalised Chitenge into a brand with some following. Kutowa Designs has transformed Chitenge material from traditional wear to every day wear, including office attire! Towani started off designing Chitenge garments for herself, but from the comments and appreciation she got from people, she saw the potential to make a living from her passion. So much so that she now has her own outlet on Nangwenya Road in Lusaka. What is more, Towani is very clear about her target market – i) promising young professionals, ii) expatriates and iii) Zambians and Africans in the Diaspora. One of her collections is called Yalicious® for the ready to wear Chitenge garments. If there were still any doubters as to the viability of the Contemporary Chitenge garments, they just have to look at Towani’s business. She says that she broke-even three months after opening her shop (how many businesses break-even in three months? ), mostly because she already had a client base from when she was operating from home. But to understand why Towani has been successful in the Contemporary Chitenge business requires closer examination. In the first instance, there is significant innovation involved in her designs. As she puts it, ‘it’s cutting Chitenge in ways that create new things’. And so her use of high waist designs, strategic placement of pockets and use of pleats impute onto a Chitenge a slimming effect. In some designs she also employs a “mirror effect” at the back with a slit suited for the “African bum” as part of the same effect. Towani is very innovative in the way that she uses features of the fabric to achieve her design objectives. Her design work is a continuous effort and differs from fabric to fabric, with disparate ephemeral ideas eventually coalescing into a collection. Towani aims to produce four to six new collections each year. But there is also a much bigger picture to Towani’s designs. This is the manner in which she infuses environmental concerns into her designs. The Kutowa Design for instance has in it the Tupenda Collection. Literary, these are discarded bottle tops that Towani has used in the designs of outfits under this collection. What is more with this collection is the extensive impact it has on community as a whole, while having a very strong conservation effect. Towani uses township women to pick up the bottle tops and to sew pieces of Chitenge material over them. Towani uses off-cuts from her “production” process to give to the women to cover the bottle-tops, hence wasting next to no materials. The tupendelos (Nyanja word for bottletops) went beyond adorning garments as part of the design, to being designs in their own right. So there are tupendelo bracelets and tupendelo belts. Towani has had custom orders of the Tupenda Collection, and on the basis of the same represented Zambia at a FIMA or Festival Internationale de la Mode Africaine in Niamey Niger in 2011 with the Tupenda Pamodzi Collection. Another unique feature of Towani’s designs and environmental consideration is the manner in which she has fitted the shop. She refuses to use imported fittings in her shop and has mannequins made using Zambian copper wire! The shelvings and railings are made of local wood material crafted by a locally available carpenter. Another unique aspect that Kutowa Designs has brought to Fashion, and in fact to business overall, is the use of collaborations. This is a significant departure from the way most Zambian ventures are undertaken – wanting to keep them small with full control, as opposed to collaborate and extend benefits quickly. Kutowa Designs collaborates with entities with similar business ethos and values. So for instance, the jewellery designer, Magic Hands of Africa, they collaborate with uses locally sourced materials and involves community in her work. The bags made by Chikumbuso displayed in the Kutowa shop – are made from recycled plastic bags by a community of women that involves those disadvantaged with effects of the HIV/Aids pandemic. The other collaboration Kutowa is involved in is coming up with a joint collection with Kwahaye (George Siyumbelo) to be called “Jige Madoda” (meaning: men are on the move) for men’s every day Chitenge material wear. While the shop that Towani has opened on Nangwenya Road is a significant part of distributing her designs and productions to the market, it is worth noting that Kutowa has a significant presence on electronic media, with a following of almost 2,000 on Facebook®, with order processing and fulfilment in her business involving both electronic and brick and mortar aspects. So it is not uncommon for a customer to see Kutowa Designs on Facebook® and walk into the shop to purchase. 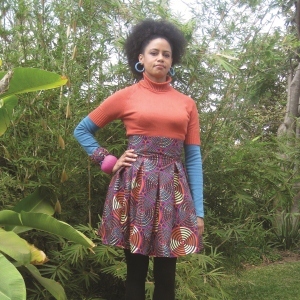 Kutowa Designs are also found on an online store dedicated to African Wear, www.sapelle.com where Towani has supplied more than 70 garments to date. The online outlet is particularly important for fulfilling orders for customers in the Diaspora. Kutowa sells 50 to 100 outfits per month. The other complementary asset that Kutowa has is her marketing strategy of dressing Mutinta (singer) for her concerts and advertisements. The designs from the Tupenda Collection were featured in the advertisement campaigns of one of the Telecommunications companies in the country. But a significant aspect of marketing is through word-of-mouth with some public relations effort. Also, Kutowa Designs are featured at any number of Fashion Design Shows that are regularly held in the country. The risk that Kutowa may not achieve optimum appropriation of gains from Towani’s designs does not seem to be much a concern for several reasons. Firstly, Towani believes that the Kutowa Designs stand out for their uniqueness and any imitation will be very easy to spot. Secondly, so as to be prepared to settle future disputes, Towani mails images of her designs to herself and keeps these unopened to be produced and opened at the time of dispute. It is an informal way of achieving intellectual property protection, and as with any method it has its pros and cons. Towani needed to mass produce some of her designs, it would be easier and make more economic sense to manufacture the garments in China. This is a tragedy for the whole country because not all the benefits that could accrue to the economy in the value-chain of Kutowa Designs and production are localised, and in fact a great proportion accrue to foreign countries. Surely given the volumes of Chitenge that women in Zambia use on a daily basis, this justifies our own Chitenge industry? And the fact that Towani could use some in the process would just be a bonus. Well, who would have thought that a man keen on writing on Innovation Made in Zambia could have anything, let alone so much, to write about Chitenge Designs. But this is testimony to the manner in which Towani Clarke has revolutionalised Chitenge wear. Indeed, Chitenge wear will never be the same again. But while this may be a radical change for Zambia, West Africa has already established Chitenge wear in its main stream day-to-day wear. No doubt Towani will eventually get Zambia to the same level. Watch the space. Dr Chabala writes in his personal capacity.